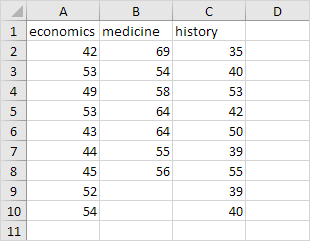 Below you can find the salaries of people who have a degree in economics, medicine or history. H1: at least one of the means is different. 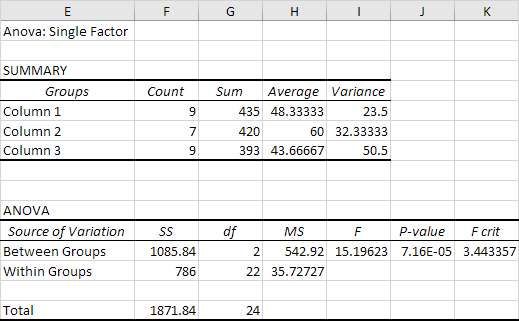 To perform a single factor ANOVA, execute the following steps. 2. 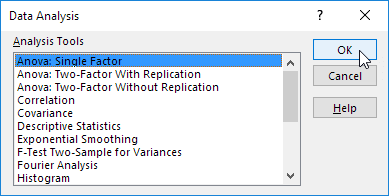 Select Anova: Single Factor and click OK.
3. Click in the Input Range box and select the range A2:C10. 4. 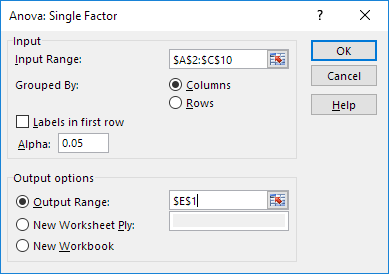 Click in the Output Range box and select cell E1. Conclusion: if F > F crit, we reject the null hypothesis. This is the case, 15.196 > 3.443. Therefore, we reject the null hypothesis. The means of the three populations are not all equal. At least one of the means is different. However, the ANOVA does not tell you where the difference lies. You need a t-Test to test each pair of means.